This soup rocked my world this weekend! And got rave reviews from the friends I shared it with, I might add. An extremely simple recipe to create, just gather the ingredients, toss them into the Crockpot and leave it alone for 6-8 hours. At the end, blend it all up into a creamy pot of deliciousness and enjoy! This is the perfect type of meal to prepare the night before, set the Crockpot to ‘on’ before you leave for work and have a hot, delicious, nutritious meal waiting for you around dinnertime. Place all ingredients in slow cooker and set to Low. Allow 6 to 8 hours to cook. 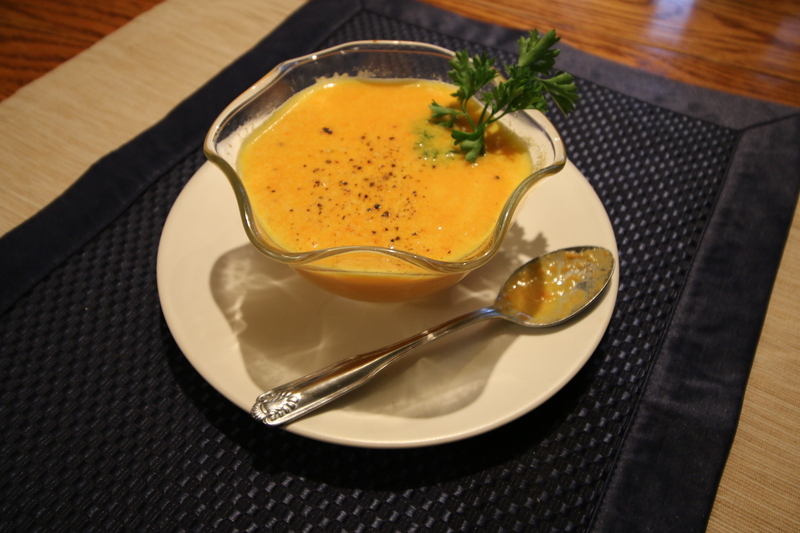 When squash is soft, blend soup with an immersion blender or carefully transfer to a blender to process. Consistency should be smooth and silky. Season with unrefined sea salt and pepper, and top with a swirl of olive oil or balsamic vinegar. 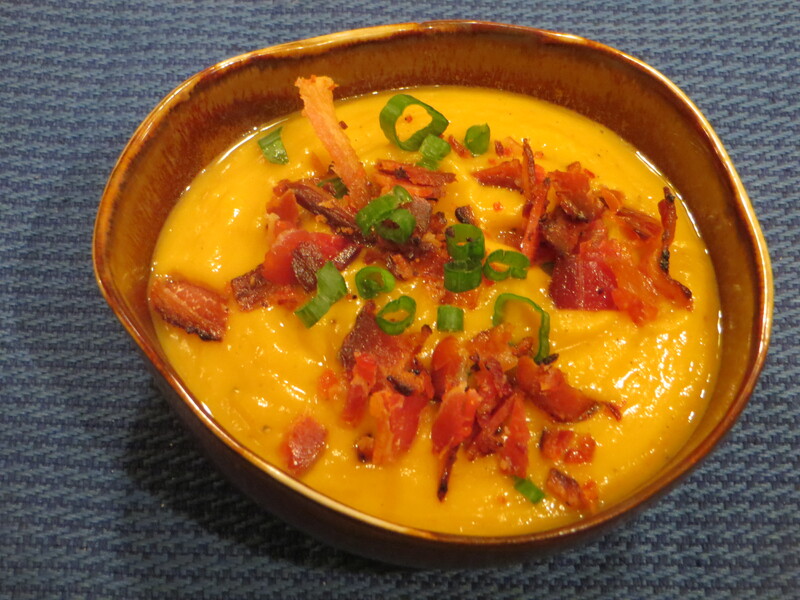 In the photo, I also added a topping of crisp bacon for a little extra protein and green onions for a tasty zing. Injoy! I love the changing colors of fall, the rusty oranges, bright golds and fiery reds. I love the fashion of the cooler sunny months, too. Tall boots and tights, layers of sweaters and scarves. And boy do I love the autumn foods! The warming quality of root vegetables, hearty greens and savory baked goods fresh from the oven. 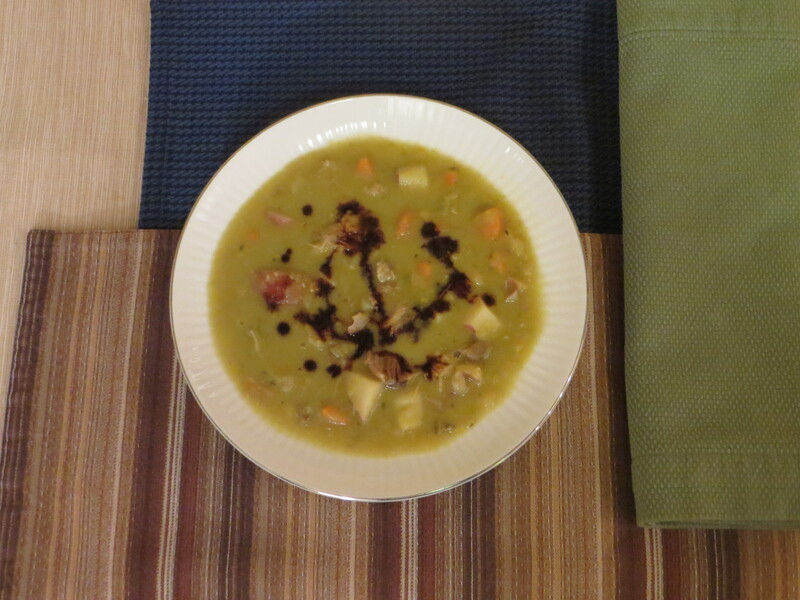 This particular Sunday I was aching to try out a split pea and ham soup from scratch. One of the special treats of my childhood in northern California was when my family would drive the 6 or so hours down to LA to visit my oldest brother, Steve. Just my dad and I on a couple of occasions, my two sisters and I a few times. As I got older, I visited with my high school boyfriend once or twice as well. The highlight of every single drive down was our tradition of stopping at Pea Soup Anderson’s in Santa Nella. The best split pea soup around! It is perfectly seasoned, delicate and hearty, creamy and layered with rich flavors. And it is served with the most delicious warm pumpernickel bread and onion rolls, plus a small plate of all sorts of toppings… minced onion, sour cream, shredded cheddar cheese. Perfect! The unfortunate part of growing up with an exquisite memory of a certain food is that it is nearly impossible to recreate such perfection. Particularly when it comes to something as simple yet easily underwhelming as pea soup. You know what I’m talking about if you have ever ordered a bowl of the green pasty stuff served in pretty much any chain restaurant anywhere. So there I was, a lovely autumn Sunday at the Boyz Haus, ready to dedicate the better part of my afternoon to manifesting divinity in a bowl. Or at least something tasty I could dish up for lunch during the football game. Success!! It barely seems right to call this a soup, however. The rustic blend of potatoes, carrots, celery and roughly shredded ham serves more like a stew. And you could use a knife to ration the refrigerated leftovers. Also, just a side note, this is the perfect project for a chilly, rainy autumn day when all you want to do is be inside anyway. This hearty and wholesome kitchen creation truly does take about 4 hours, so get into it! I don’t recommend shortcuts on this one. The layers of flavor and the way they develop really does take time. Enjoy! Use a small 2 1/2-pound smoked picnic portion ham if you can find one. (I went to Bill the Butcher for mine.) Otherwise, buy a half-picnic ham and remove some meat, which you can save for use in sandwiches, salads, or omelets. The finished soup will continue to thicken as it stands but can be thinned with some water when reheated. 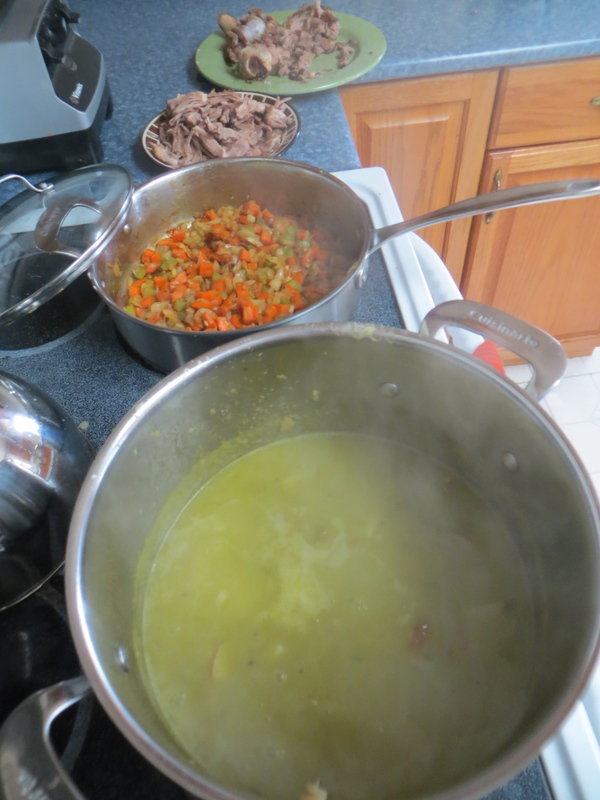 To cut 45 minutes off the cooking time of the soup, simmer the ham 1 1/2 hours, then add the split peas to the pot. When the ham is tender, after about 45 minutes more of simmering, remove it and shred. 1. Bring 3 quarts water, ham, and bay leaves to boil, covered, over medium-high heat in large soup kettle. Reduce heat to low and simmer until meat is tender and pulls away from bone, 2 to 2 1/2 hours. Remove ham meat and bone from broth; add split peas and thyme and simmer until peas are tender but not dissolved, about 45 minutes. Meanwhile, when ham is cool enough to handle, shred meat into bite-sized pieces (see illustration below) and set aside. Discard rind and bone. 2. While ham is simmering, heat oil in large skillet over high heat until shimmering. 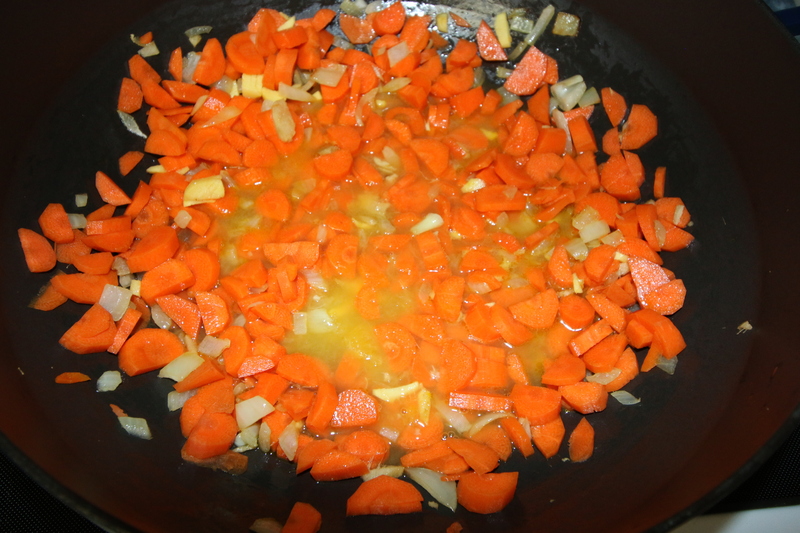 Add onions, carrots, and celery; sauté, stirring frequently, until most of the liquid evaporates and vegetables begin to brown, 5 to 6 minutes. Reduce heat to medium low; add butter and garlic. Cook vegetables, stirring frequently, until deeply browned, 30 to 35 minutes; set aside. 3. Add sautéed vegetables, potatoes, and shredded ham to soup; simmer until potatoes are tender and peas dissolve and thicken soup to the consistency of light cream, about 20 minutes more. Season with ground black pepper. Ladle soup into bowls, sprinkle with red onion, if using, and serve, passing balsamic vinegar separately.